The microglitters from Lynnderella's Fall in Love with New York core collection are killing it. I am kind of on the fence about microglitters, sometimes I love them and sometimes they are just meh for me. The three I have tried so far from Lynnderella's fall collection have been pure LOVE! 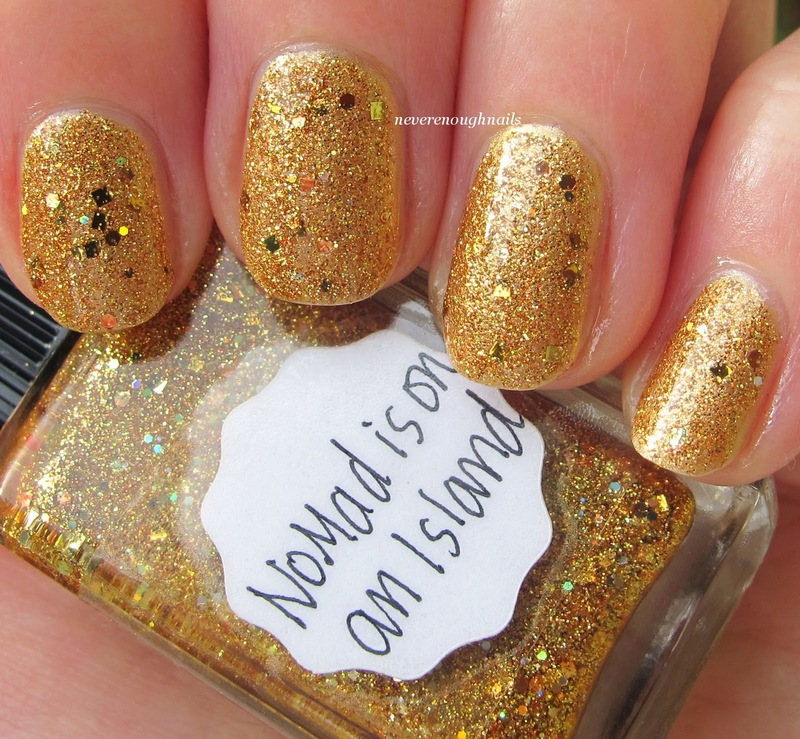 My latest NOTweek is Lynnderella NoMad is on an Island over OPI 50 Years of Style. 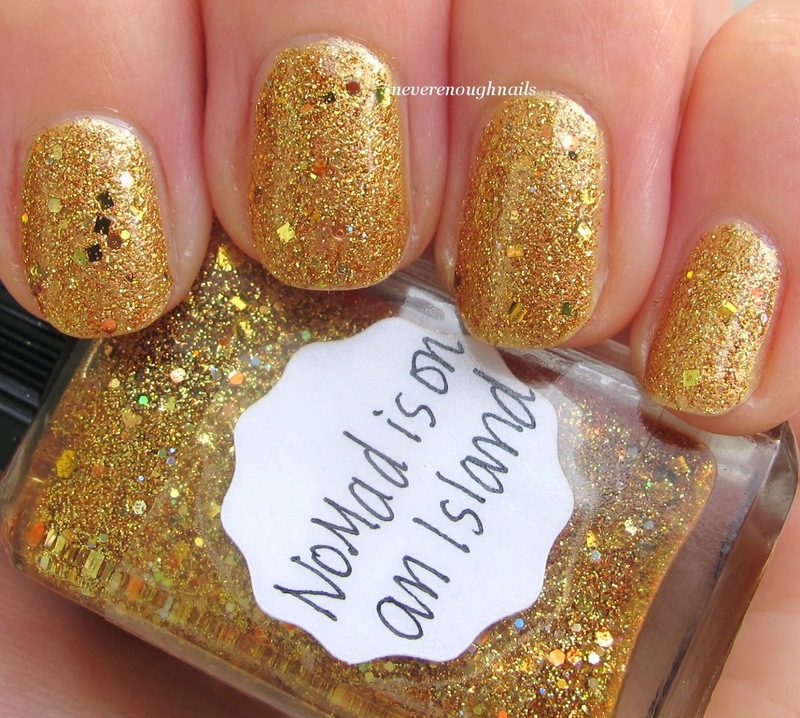 NoMad is on an Island is a gorgeous golden caramel holo microglitter with gold and copper larger glitter accents. Lynnderella describes it as a "honey caramel butterscotch gold holographic with gold, copper and tan accents in a clear base". Mmmmmmm honey caramel butterscotch sounds as delicious as this polish looks! This polish is so sparkly in person and even with a blurry shot (below), my camera didn't want to capture the true magic of it. I was so distracted all week wearing this mani! This is just one coat of NoMad over two coats of OPI 50 Years of Style. NoMad could definitely be full coverage on it's own in 2-3 coats. The glitter is nicely dense and the polish has just the right glitter to base ratio. It applies easily and smoothly, no bald patches. This is one microglitter that has my full and undivided love and attention. Based on how much I love the first 3 polishes I tried from Fall in Love with New York, I am going to order Flat Irony, Positively East Fifth Street, Fall in Love, and Couture at the Navy Yard. Lynnderella NoMad is on an Island is available now at lynnderella.com and the Lynnderella StorEnvy. For news and updates on Lynnderella lacquers, visit Lynnderella's blog. Me too Ananka! I love gold polish anyway, but this one is just crazy beautiful!